I'm quite the generous giver when it comes to beauty products. I've been known to gift friends and colleagues with Dior, NARS, M.A.C, even Chanel. But one thing people will have to pry out of my cold, dead hands is my collection of BURN Candles. My obsession with these candles runs deep. Years ago, on my first trip to L.A., I discovered the fabulousness that is this candle collection at one of my favorite stores ever, Fred Segal. At the time, I was remiss to spend upwards of $60 on a single candle, and I let the chance pass me by. Fast forward four years to my encounter with them at Bergdorf Goodman, and it was a different story altogether. I went in on a weekly basis, buying up every candle on sight, hungering for each and every scent to be my own. I snapped them up during HauteLook sales, scoured beauty websites and stores alike to curate my collection. And then my best friend texted me one day with the most amazing news. "I'm at Ann Taylor and they have BURN candles for 50 percent off," she said. "How many do you want?" "ALL OF THEM!" I texted back furiously, hoping she would see it before leaving the store and buy up the entire stock for me. As luck would have it, she gifted me with three fantastic candles that I've finally gotten around to burning. Each one is delicious, delectable, delightful ... a divine indulgence of the highest order. They smell amazing on their own or layered atop one another -- I've taken to burning two at a time both for aesthetic purposes and for the simple fact that they make my apartment smell unbelievably amazing for hours on end. 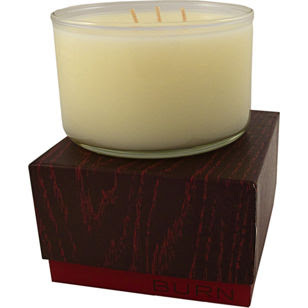 I'm partial to the three-wick candles, which retail for $60 and have a burn time of 100+ hours! If that's a bit steep for you, the single-wick Voyage candles are $25 and have a burn time of 35+ hours. it is so beautiful. i like it to much. i really wait this time when i bought it .